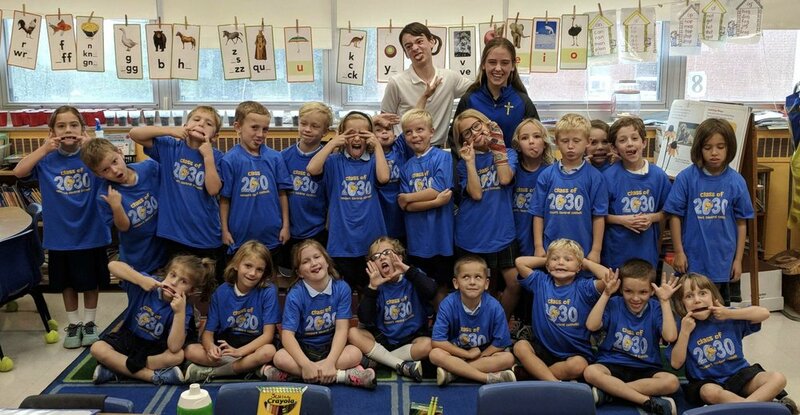 Future Thoroughbreds — First Grade Students were excited to receive Class of 2030 T-shirt. Mrs. Jill Aseltyne, Teacher at NCC and her daughter Bailey, first grader at St. Therese School share a special moment. First Grader Students at St. Catherine of Siena School. Keegan Collopy, First Grader at St. Catherine of Siena and his dad Mr. Kenny Collopy, Director of Development at Newport Central Catholic High School. St. Catherine of Siena first graders. Little Brother, Mason Drury was excited to have his big brother Dominic come to visit his school, St. Thomas.